"dolly parton tribute act, dolly parton show, dolly parton impersonator, dolly parton tribute show, dolly parton tribute singer, andrea pattison dolly parton lookalike, dolly parton solo tribute, country and western tribute act, country and western tribute acts"
Although this project was originally intended for theatres and larger venues, it has come to our attention that some clients don't have the facilities or the budget to hire the full band. For this reason Andrea has recently started doing solo performances as Dolly for weddings, birthday parties and corporate events. Andrea's solo performance features all of Dolly's most well known songs, as well as country standards and more up to date Dolly tracks. Andrea performs in the same outfits she wears in the theatre performances, and since the solo show is usually two 40 minute sets, she changes her costume and wig during the break. Andrea uses state of the art PA and lighting and since most of the backing tracks featured in the show were recorded by the band, the high musical standard is maintained. 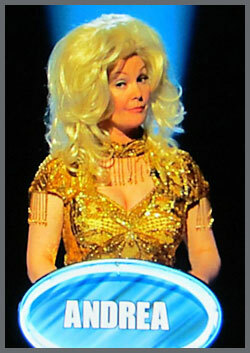 Andrea appeared on The Weakest Link in December, along with other professional tribute singers. She came second, having made it to the final. Andrea was asked to sing during the show and got to answer some questions "in character". 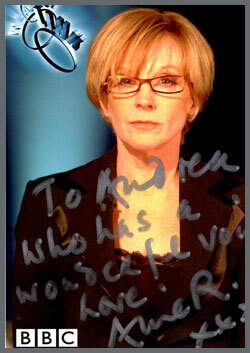 A few months after filming the show Andrea received this lovely postcard from Anne Robinson, shown left.